And all this time everyone assumed the first Seinfeld-inspired infomercial product would have been a knock-off of the Bro/Manssiere. The episode that may have given rise to Muffin Top Magic is, of course, the one in which Elaine and Mr. Lippman decide to sell only muffin tops while throwing the rest of the muffin away. 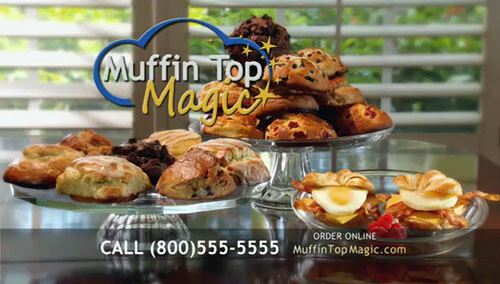 In their hubris, the creators of Muffin Top Magic think they can ignore Elaine’s sage advice and simply bake the tops of the muffins. If this product proves to be successful, keep an eye out for infomercials selling reverse peepholes and cologne that smells like the beach. When I saw the headline, my first thought was that it would be another useless Ab Roll/Tone/Shape/Sculpt/Insert-useless-verb-here tool. Lol, are people really that picky, wasteful and spoiled in America that they throw away the bottom of a delicious baked item simply because the top part tastes better? To me that’s equal to throwing out the cookie parts of the Oreo because you prefer the cream and vice versa. Such a waste! I seriously feel like inventing some sort of bin for each and every house that you can store foods or part of foods that you and/or your family are too picky (can also be used for other uneaten foods due to allergies, diet, etc) to eat that you can put out like a recycle bin that can be picked up each day and delivered to food banks. I’m sure millions of less fortunate people all over the world would be more than glad to eat a muffin bottom. I’ve never heard of anyone who only eats the tops of a muffin…. who are these so-called Americans who do this? I don’t know a single person who does that! Well, here in England I’d call those rock cakes. People have been baking them for centuries without special pans. Those muffin top-only pans have been around for a long time. I’m pretty sure being “picky wasteful and spoiled” is not an American specific behavior. In fact, I’ve yet to meet anyone who just eats the top of a muffin. A lot of people do pop the top off and eat them separately but that’s where it ends. Aren’t those just really fluffy cookies? I actually only eat the exact middle of a muffin and I burn the rest in the trunk of my car with the middles of french fries. its top of the muffin to you! I much prefer the top of the muffin, and will ration it so that there will always be some of it in every bite if at all possible, and always make sure that the last bite will be of the top. I eat whole fries, George O., but only if they have flat, or “square” ends. If there are so very few of those that I’m not getting any fries to alternate with bites of burger, I will eat the flat side of a half-and-half fry and discard the non-square side. I make an exception for McDonald’s fries, however, which are, rather than a kind of fry, more properly considered suis generis. (As, I would argue, a Big Mac is to a hamburger). For the shocked and appalled out there (like Jay), I fully acknowledge to myself, and repeatedly note to my daughter, that it is only because we live in the richest country that ever existed that we can behave like such psycho-OCD princesses with regard to our food.